Well December has been a bit of a blur for me, what with work. So haven’t really had much time if any to go down the plot. So today I managed to get a few hours to go (actually it was to give my new Dirt Boot willies a road test!). Everything was looking good the cavalo Nero was looking amazing and the celeriac was nice and fat, so when I saw the state of my Brussels sprouts I was a little disappointed. Firstly they were ABSOLUTLY covered in white fly; I have never seen anything like it! 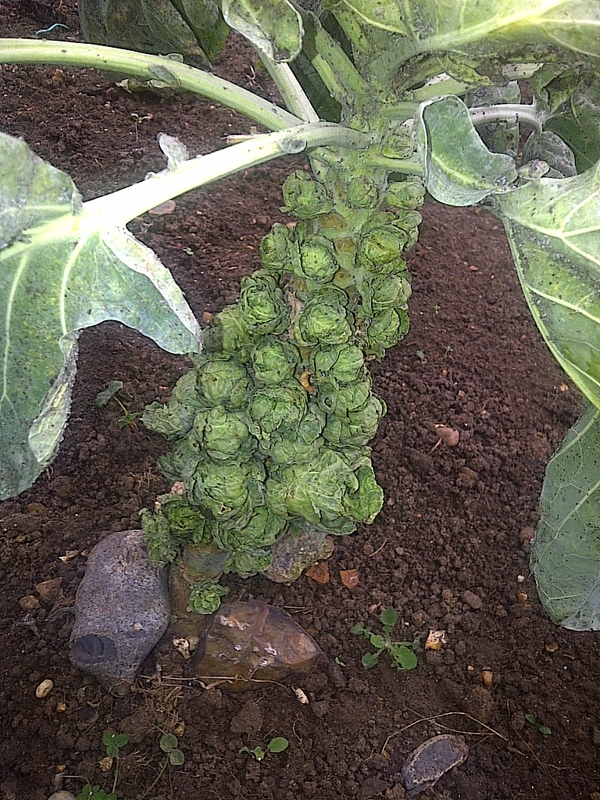 Secondly they had not formed nice little balls they were more like sprout flowers and thirdly they smelt odd! Wasn’t too sure why they had turned out so poor? I have them a rally good start with some lime and crushed egg shell for potassium, and were looking really healthy back in November, it’s funny how things can just turn. 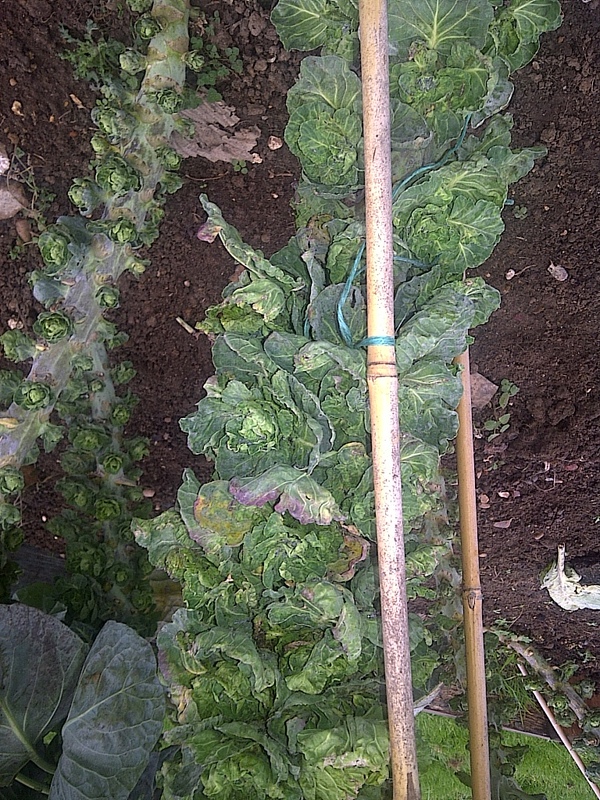 In fact this year I haven’t had really any meaningful success with any form of brassica other than my early white cabbages everything else has been poor my sprouting broccoli well they have just grown and grown and showed no sign of “sprouting” and my winter cabbages were attacked whitefly. But as they say in show business, the show must go on and next year they will get more attention (also I will do a bit of reading up and asking fellow allotment holders for advice.) 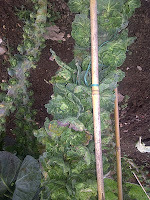 and hopefully have a better harvest of Brassicas. Also today I started planning for the new season what’s going to go where and what contraptions I can build to make life that much better at plot 58. 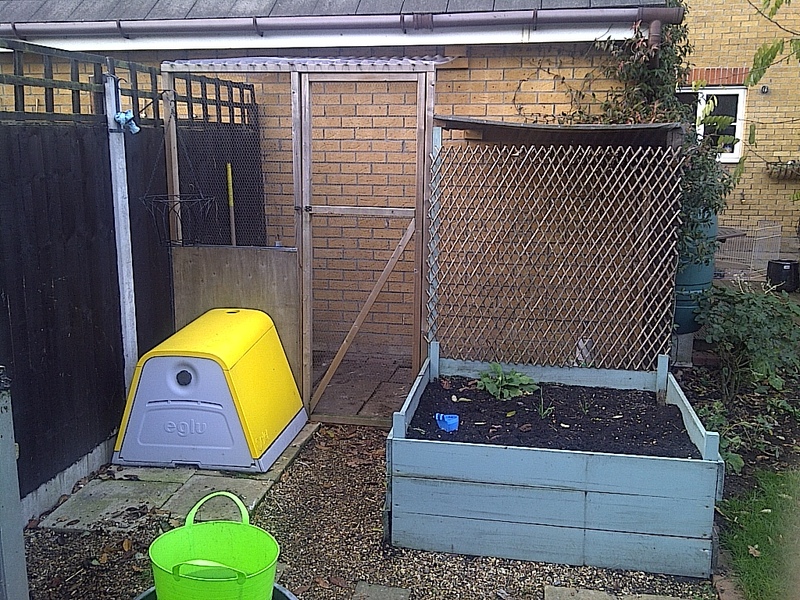 The plot itself is not yet boxed in as that seems to be the “thing to do” down my way but trying to come up with a cheap or free sustainable way is not easy! Anyway enough of me babbling on have a good new year and see you in 2012! As a Chef, Christmas is a VERY hectic time of year, the demands for offices to have their annual party and celebrate the year becomes at times chaotic. So getting time to get down the Allotment becomes a juggling act with home life, work life and Allotment time. So today I manage to get some time to go to the plot, but when I step outside its Bloody freezing and showing signs of rain so with a sigh I neglect to go instead taking the time to make some Christmas treats for the family & friends, as this will be the only chance I get now. 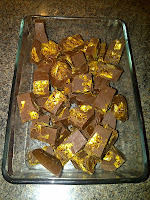 I thought I would pass on some of my recipes for you to try to bring that Christmas joy that giving food brings to me. On the list today was marzipan the charismas cakes. I have made 5 one for the Annual Family Christmas cake competition and 4 for gifts to give away (little ones 8cm square). Then I set about making some honeycomb to make some fudge with later this is easy but can be a little dangerous if you’re not careful! · 50g of maple syrup or golden syrup whatever is your tipple! Place the first 5 ingredients in a pan and heat until you get to “small Crack” stage on the sugar thermometer or (138°) then remove from heat and stir in the bicarbonate of soda (Note: this will erupt like a volcano so make sure the pan is big enough to double the volume of mixture!) then place in the greased baking tray and allow to cool. When cool break up into chunks and store in an air tight container. These really do make great Christmas gifts that can be enjoyed by everyone. 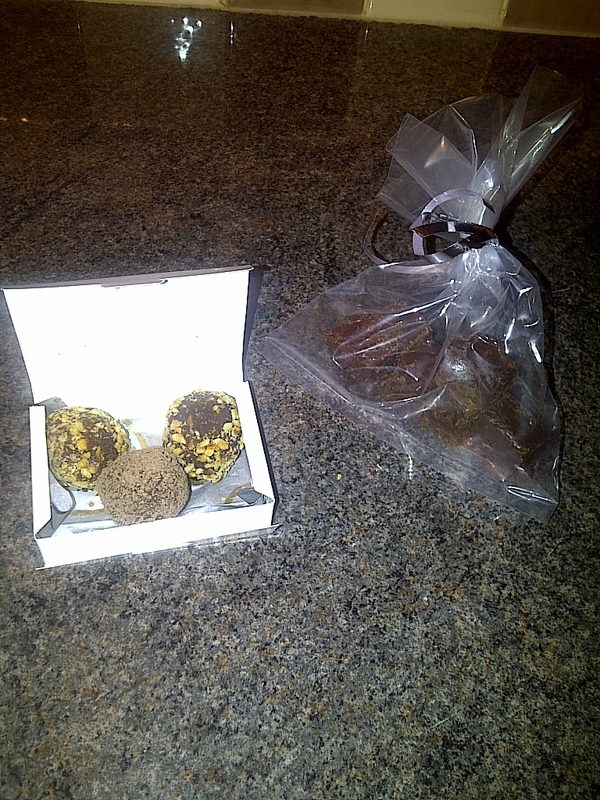 I also made some chocolate truffles which are just too addictive and not sure that they will make it as gifts! Cheese is one of my most adored ingredient and I always love having a jar of something to go with it. In a pan add the butter and melt then sweat the onions with the fresh thyme and the spices and salt & pepper. You want to start the caramel process so about 5 minutes into cooking add 50g of the sugar, and cook for a further 10 mins. Now add the rest of the sugar and the vinegar and cook for another 5-10 mins. Remove from heat and add to jars. This is best made a week or so before you want it as it gets better with age. A few weeks ago I also made a Red Pepper Jam with my abundance of Red peppers from my allotment this year; it goes really well with cold meats or cheese. 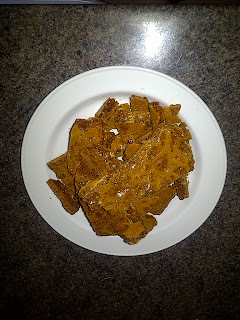 Click the link below for the recipe. 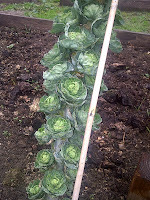 Hopefully I will get down the allotment soon, but the demands of a chef this time of year, may put a damper on things! 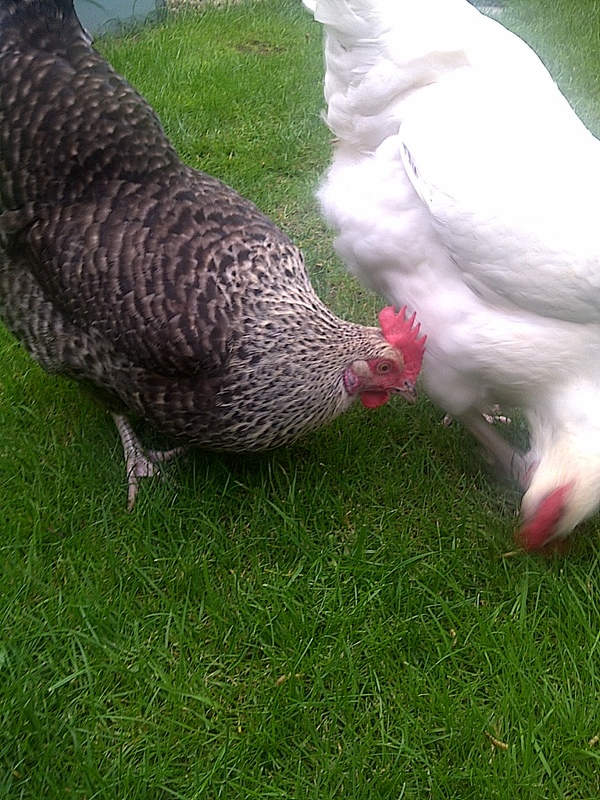 Meet my Girls, Hetty and Hilda my 2 chickens. We have had them for nearly 2 years now and they are truly part of the family. I have always wanted chickens but it took some time for me to get the Wife on side, but after watching a program with Alys Fowler and her Garden and her keeping chickens I got the all clear. Admittedly I did do quite a bit of research first as I had 2 big questions. Are they noisy? And how much room do they take up? 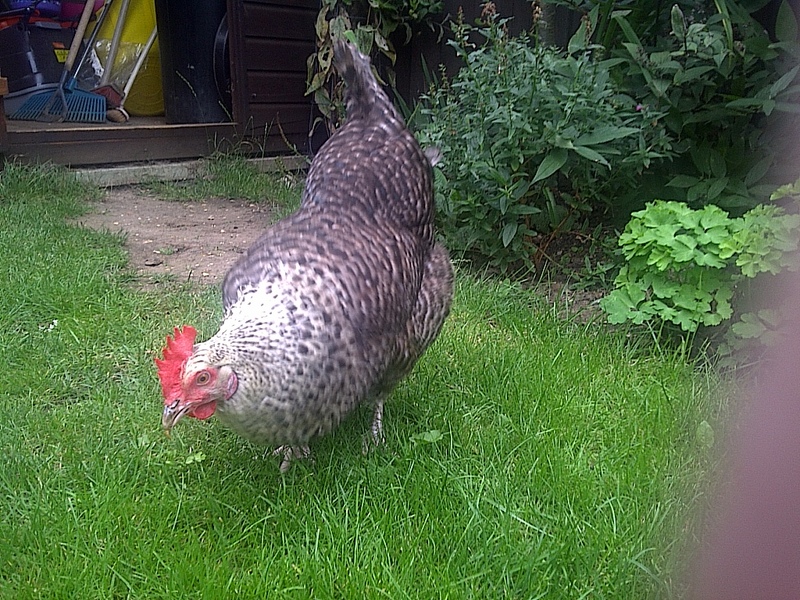 As I live in built up area and the last thing I wanted was chickens annoying all my neighbours! 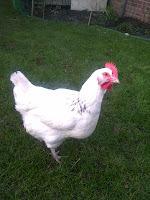 I joined a website called Omlet http://www.omlet.co.uk they are amazing and would recommend you check them out if you’re looking to get chickens they have a forum for everything chicken . So after having my mind put to rest we were ready to get some girls. I also spoke with my neighbours either side and told them of my desire to get chickens and gave them the website address so they too could get some piece of mind. EBay was the destination for our first hen house we went for something cheap (BAD mistake!) and easy to get hold of. 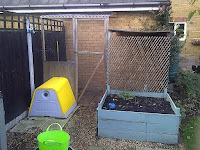 A wooden hen house with built in run was our tipple, 3 days later it was up and ready for the girls. So one fresh spring morning my little family and I set out to a local chicken breeder to add to the family! I was set on a Sussex Red and the wife like the hybrid called Speckeldy. 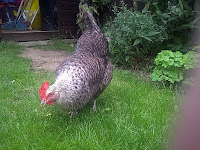 We got them at 16 weeks (this is called point of lay or POY) as at 16 weeks there ready to lay eggs. But the breeder told us it would take them 2-3 weeks to settle in their new home before they start to lay. It took about 3 weeks for our girls to lay there first egg but it was WELL worth the wait. Fresh eggs are like fresh veg from an allotment you really can’t compare them to shop brought even if you get the best on offer, there simply the best your ever taste. There is nothing quite like a freshly laid egg with your bacon on a Sunday morning. This year we decided to upgrade our hen house to one from the Omlet website as wooden hen houses while they serve a purpose they are imposable to keep clean and hygienic for your hens. 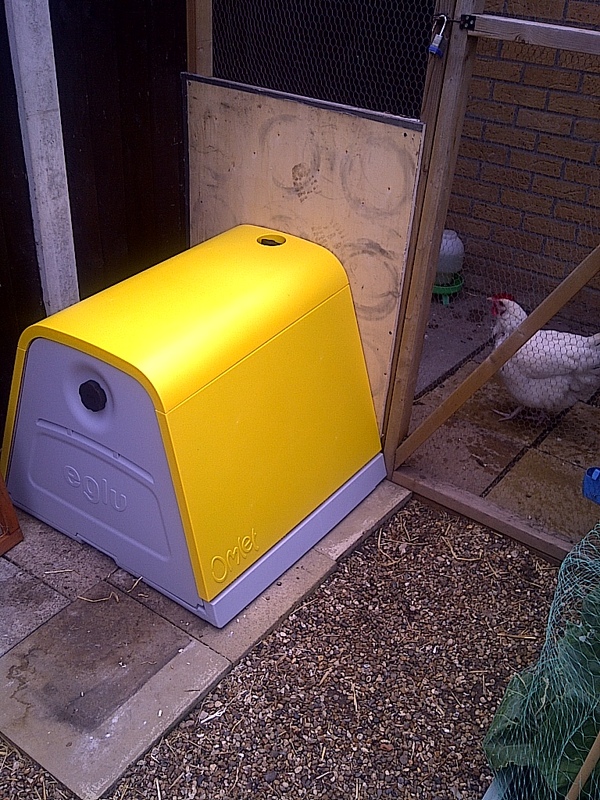 We went for a Eglu Go without the run as we have a nice run for our girls already which I built a year ago, and just wanted a nesting box and sleeping area. Hetty and Hilda do more than give us fabulous eggs, they help with my garden too. 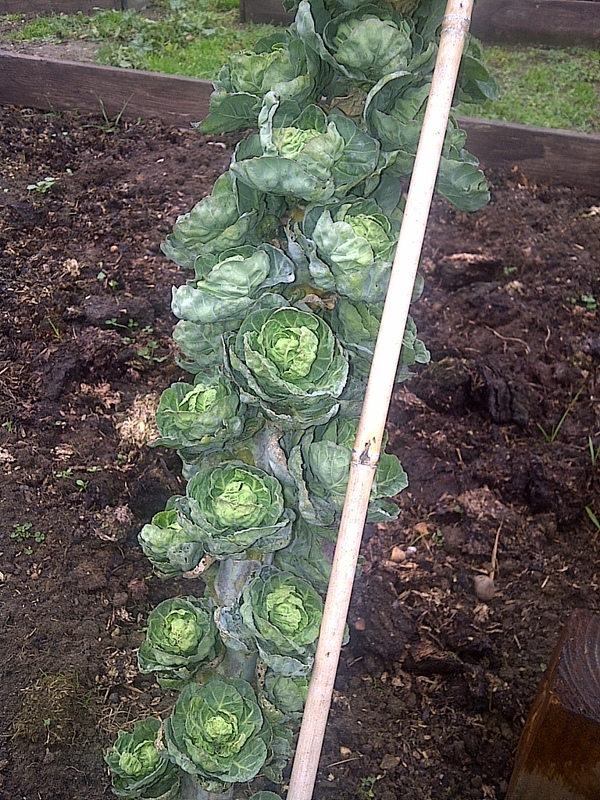 Firstly Chicken manure on your compost is AMASING it is a perfect addition to give you a wonderful rich compost, I have noticed it this year with my compost it has given all my plants a extra boost and the squashes loved it. Secondly they help keep the slug and snail population down too. I am a big fan of Hosta’s and have over 10 in my garden but each year even with my best efforts some get demolished by slugs and snails but since my girls are on the scene they have thrived. There is nothing more appetising to a chicken than a slug or snail. I let my girls out in the garden at least 3-4 times a week to have a scratch around and eat the grass. 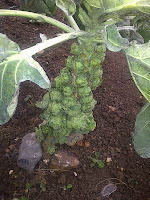 You do have to protect things in the summer from them as they will eat it but on the whole there do behave themselves. 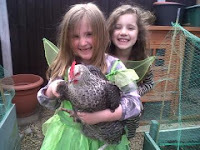 Thirdly my 2 young daughters Love the chickens they are very good with them they pick them up (which the chickens love) and play hide and seek with them. And the chickens love having them around; in fact they love it when you’re in the garden with them. They like a good stroke and even better is when you’re doing a bit of weeding and they nip in to grab the fresh weed to snack on.